As I have mentioned many times, at the core of any successful trading and investing strategy is an edge. Few traders and investors ever attain the significant market edge they desire and there is a simple reason for this. Most new market speculators begin their quest for edge building information and education on the internet. They naturally are drawn to websites with the best marketing and popular authors and so on. The problem with learning how to properly trade and invest with the needed edge from all this is that everyone else is reading the same material. Your competition is learning the same investing strategies you are. They are learning to buy and sell exactly where you are learning to buy and sell, and therein lies the trap. Simply put, if you are processing market and strategy information the same as others (your competition), you can’t possibly have an edge. For this reason, I typically focus my articles not on conventional trading, technical analysis and market information, but instead on edge building reality based concepts that you won’t find on the internet. In today’s piece, I will cover two of many simple tools that may help you in your quest for that needed edge when speculating in markets. It’s easy to see what the current trend is by looking back at recent prior data in any market on a price chart. Most of you are very familiar with the conventional concept of higher highs to identify up trends and lower lows to identify downtrends. That’s how everyone looks at and thinks about trends. But, is there another way that can give us an edge when investing in the markets? A little concept I can share today has to do with assessing the strength of a trend. Here is a different way to assess how healthy the current trend is and when and where it may end. While supply and demand levels are the strongest way to determine this, we can also measure the distance between the lows of the pivots during the uptrend. Notice the uptrend in the chart below and how the distance between the pullbacks (pivot lows) is decreasing as the trend moves higher. The logic behind this is that a strong trending market does not pullback often. If it does, it is not a strong trending market anymore. Keeping with our constant supply and demand theme, remember that a trend on any time frame is really a supply and demand imbalance moving back into balance. This concept works equally in any time frame. Uptrend: When the distance between the pivot lows is decreasing, this suggests price is nearing a supply level, the trend is becoming weak, risk to buy is increasing and profit potential for buying opportunities is decreasing. The uptrend is likely almost over. Downtrend: When the distance between the pivot highs is decreasing, this suggests price is nearing a demand level, the trend is becoming weak, risk to sell short is increasing and profit potential for shorting opportunities is decreasing. The downtrend is likely almost over. 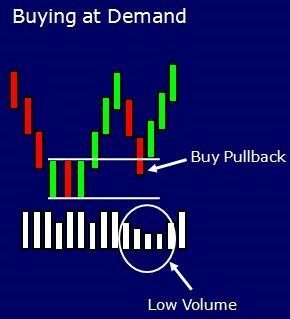 Volume, in my opinion, is one of the most misunderstood pieces of information when used for assessing trading and investing opportunities. While there are many misunderstandings with volume, I will focus on one today that deals with turning points. Most of the books say, look for above average volume turning points. In other words, most books on trading suggest that a major turn in price should always be accompanied by high or climactic volume. My short comment concerning this is, don’t believe everything you read. If you think the simple logic through and focus on the real concepts of supply and demand, you will find that the exact opposite is actually true. Your most significant turns in price are often accompanied by low volume. Price movement in any and all markets is simply a function of an ongoing supply and demand relationship. Low risk, high reward trading opportunity exists at price levels where this simple and straight forward relationship is out of balance. The most significant turns in price will happen at price levels where supply and demand are most out of balance. The more out of balance supply and demand is at a given price level, the fewer trades/transactions at that level. This means less time at that price level. The fewer transactions, the lower the volume. So, the larger the supply and demand imbalance at a given price level, typically, the lower the volume. As you can see in the example below, at the turn in price there is actually very low volume and this is because supply and demand are soooooo out of balance. Again, don’t take my word for it, put your conventional technical analysis book down and think the simple logic through on your own. Then, go back and look at charts and you will see this is the case. At these key turning points, you have the highest potential volume but you don’t get that actual volume because most of it is on one side of the market. Instead of reading all the trading books and learning to buy and sell in markets when everyone else buys and sells (no edge)… Instead of acting on the advice of others who likely get paid for giving investment advice and not from trading… Pay attention to what is happening in front of your eyes. Pay attention to what is happening around you. Pay attention to all the simple realities that others never see. Changing your ways and getting what you want out of life requires two difficult tasks for the individual. First, you must think like you have never thought which will lead to doing what you have never done. Isn’t life too short for you to stay in the comfort zone of conventional thought? Think in reality based terms and build a life edge that delivers the positive results you desire.